I have to thank my good friend Erin for sharing this recipe with me. I remembered her mentioning she made these bowls before so I set out to make my own. 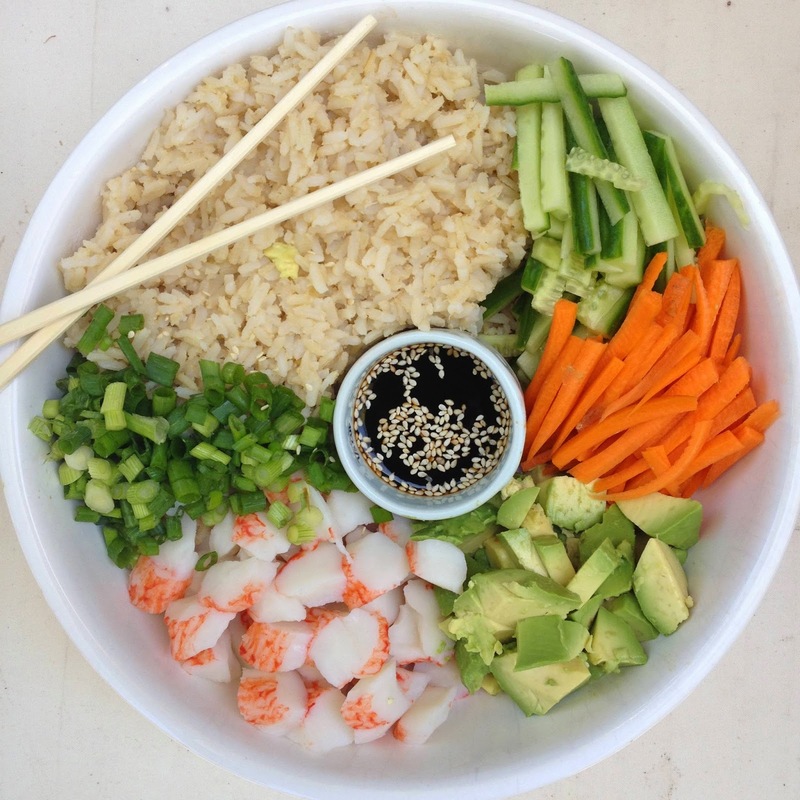 There are a million different ways you can make the bowls, it basically boils down to how you like your sushi. I love raw sushi but I was not brave enough to attempt my bowl with raw meat. Crab is Sterling's favorite so I used the good ole "K" krab:) Gotta be honest I don't hate the imitation crab. My friend Erin said that she uses shrimp and the crab in her bowls so that is another option. I have a feeling fresh crab would also be amazing. You can sub white rice if you want but I was trying to make ours healthier. Erin also recommended spicy mayo (mayo + sriracha) but I omitted that too and just used soy sauce. That looks delicious! I don't hate imitation crab either...but I think I might have to ease my way into adding anything raw into the bowl. However, ahi tuna wouldn't be a bad option! This just blew my mind - such a DUH moment. I've never been brave enough to actually make sushi at home and this is the perfect way to get the flavor without the fuss! Look amazingly delicious! I told a Japanese friend of mine one I liked sashimi. I promptly received a invite for dinner. Her husband had come back from sea fishing and I was served sliced raw fish he had caught, and a lot of it. It have been briefly marinated with some soy sauce and chilli. I was nervous at first once I tried it, I found it ok - but too chewy. Yours looks more up my street!